This decoration is ideal for spring or summer décor, you’ll need wood pennant flags, white craft chicken wire netting, wired sisal vine, E-6000 glue, clothes pins, a preserved moss sheet. Using the pennant flag as a template, cut a triangle shape from the chicken wire. You’re going to want the wire to be slightly wider than the flag to create the basket. 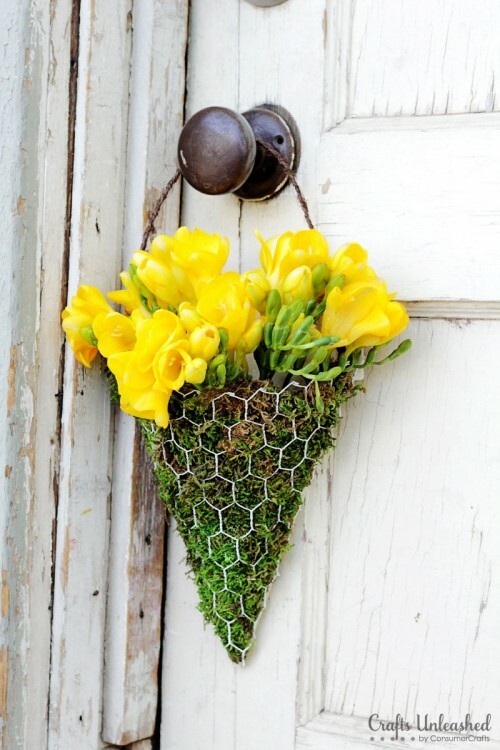 Fold over any exposed chicken wire that will be at the top of your basket. Lay the wire triangle over the wood pennant flag and fold ends over to the back. Apply a liberal amount of glue and press second pennant flag to first, making sure to catch all the wire ends in between and to match up the holes at top. Finish the decoration reading here.